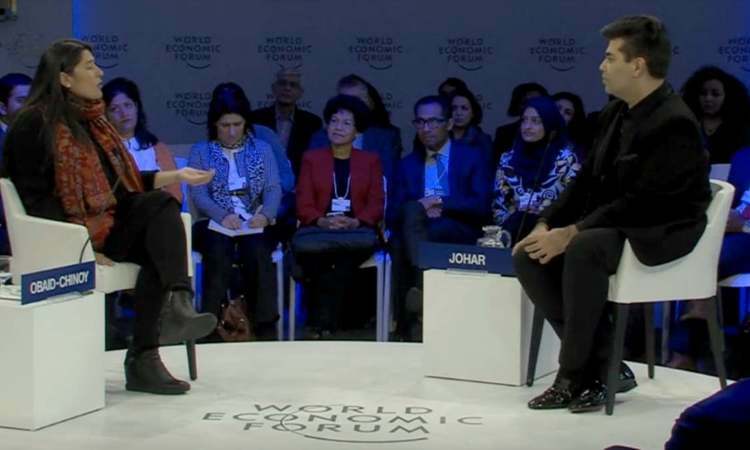 The Oscar-winning documentary filmmaker Sharmeen Obaid-Chinoy sat down with Bollywood producer Karan Johar at the World Economic Forum in Davos on Wednesday for an intense one on one about film, fame, society and the arts. It was a landmark meeting between two industry giants who are similar in how their success has forced them to contend with both praise and criticism, at the WEF meeting. Their conversation couldn’t escape a mention of recent tension between India and Pakistan especially with regard to the two nations’ film industries, famously illustrated in Karan Johar’s public pledge to refrain from working with Pakistani talent even though he’d just featured Fawad Khan in Kapoor & Sons and cast him in his upcoming film Ae Dil Hai Mushkil. “You know what I went through and it was a tough time for me. I don’t think I would want to repeat that experience ever,” said Karan, when Sharmeen said she hoped to watch Fawad Khan directed by him again. A member of the audience then asked Sharmeen and Karan if they would ever consider making a film on whether Partition was a mistake. On this, the Indian film-maker said he would never make a film on India-Pakistan in his ‘sane’ mind. “I think telling stories about today would make more sense than revisiting what has happened,” he said. In a bid to justify his stance of not treading the dangerous waters, Karan said he was being strong not “retardedly brave”. When Karan asked Sharmeen about how she felt about people saying she paints her country in a negative light, the two-time Oscar winner said she was either loved or hated by people back home, adding that she preferred that to indifference. Sharmeen is the first documentary filmmaker to co-chair the forum. Established in 1971, the World Economic Forum is committed to improving the state of the world and its annual meeting in Davos-Klosters remains the foremost creative force engaging top leaders in collaborative activities. This year, the forum is highlighting five distinct challenges: a breakdown in global collaboration; loss of identity; slow economic growth; a crisis in capitalism and preparing for the oncoming Fourth Industrial Revolution.